Panahar Bangladeshi Restaurant, Atlanta GA – Marie, Let's Eat! 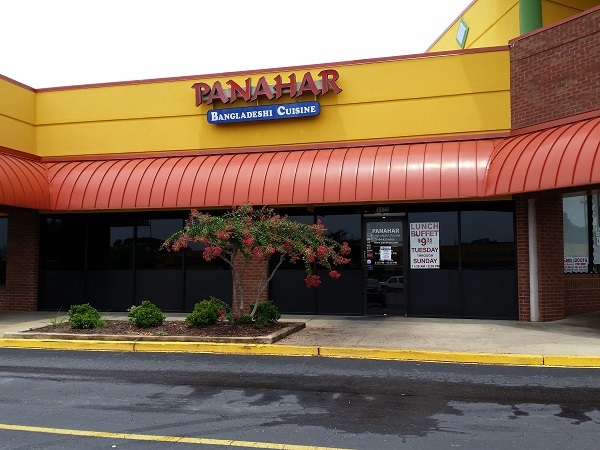 Panahar, which for many years was the only Bangladeshi restaurant in the Atlanta area, had been on my to-do list for quite some time. It had been sitting there for so long that another Bangladeshi restaurant, Purnima, opened since I’ve been saying I needed to get over here. Purnima had really impressed all of us who visited. What were the odds that the lunch buffet at the venerable Panahar would please me as much? The restaurant is really from the old tuxedo-n-curry school, even if the servers are not overdressed. The service is very nice, and there are the requisite cloth napkins tucked into water glasses, and unobtrusive quiet sitar music playing gently overhead. If you’ve never been here before, that’s okay, because you’ve been to plenty of other places that are a whole lot like it. Pictured above: an eggplant and chickpea dish, with a potato dish underneath, and a cold chickpea and cucumber salad in the little bowl. 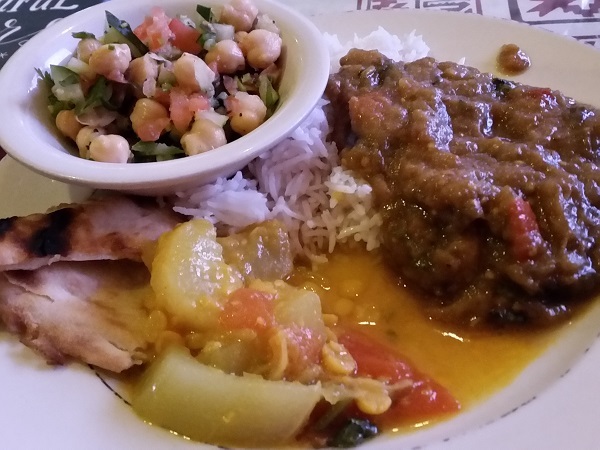 Below: another spoonful of the eggplant and chickpeas, along with butter chicken and tandoori chicken. 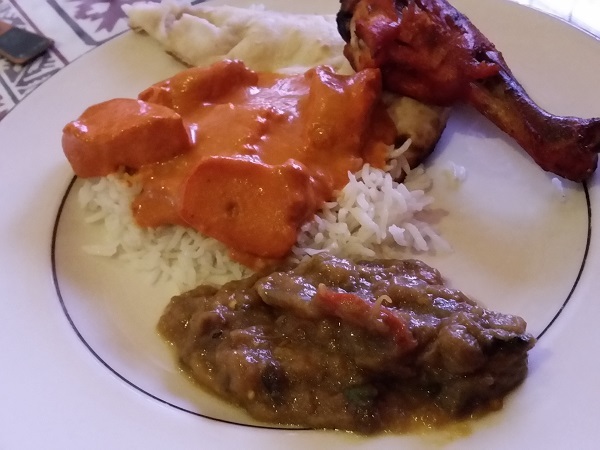 The result is a perfectly average buffet that reads and feels exactly like every other Indian buffet in town. They didn’t have anything on their buffet that couldn’t be found on other, larger, buffets. The food was flavorful and all very mild. There’s a hot sauce available which mixes well with some of the dishes, and if this all feels a bit boring, then that’s kind of what my experience here was. Nothing popped and nothing excited me. I was reading a cookbook that was far more interesting than anything that I was served. Is it always like this? Most of the stories about Panahar that I found came from visits in the evening, when people chose to order from the menu. This sounds a million times more interesting. Beef dishes – you don’t get those in traditional Indian restaurants – and fish dishes all sound interesting, even if they seem to use tilapia instead of something sustainable, and several writers have talked about the fiery spices that punctuate the evening meals. As a lunch option, the buffet is nonthreatening, average, and ordinary. As a dinner option, it made me want to try that out with some friends. A few weeks later, Marie and our son and I had supper here with Marilyn from Atlanta etc. to sample some of the things you don’t get on the buffet. I had the beef Niramish Maang-sho, which is served with carrots, potatoes, broccoli, yellow squash, and onions. Marilyn had the chicken Korma, and Marie had an order of Aloo Kopi, potatoes and cauliflower in a thick yellow sauce. Normally, I’m happy with plain naan with my meal, but Marilyn pointed out that they serve an interesting variety called Keema naan which is stuffed with ground beef. So I indulged in things that you don’t normally find in Indian restaurants, and, again, it was all right. Everything was seasoned very blandly. I think that I enjoyed the cup of mulligatawny soup more than anything else, and honestly, it really paled in comparison with the food up the street at Purnima. Posted on August 19, 2015 July 27, 2017 by Grant G.Posted in atlanta, buford highway, georgia, indianTagged atlanta, buford highway, georgia, indian. Don’t keep us in suspense. What was the cookbook? A Mouthful of Stars by Kim Sunee. I’m optimistic we’ll have a recipe or ten to share between now and Christmas. Nice. Sorry you didn’t enjoy Panahar. I love it. Have you been to Himalayas yet? Not for the blog, though I’ve been meaning to for years. It’s an old favorite (late 1990s) that I got out of the habit of visiting. Maybe soon…? you know Tilapia is farmed right? It is not a fish that I choose to eat. I like other options.